Quantity v. Quality – my books. my life. I’ve been reading a lot of blogs lately and I’ve come to one conclusion: book bloggers read a lot of books. I mean a lot. Like 200, 300, 400 books per year. Now I just finished my 29th book of the year. It hasn’t been my best year ever but I’ve never even come close to three digits. So I started thinking. 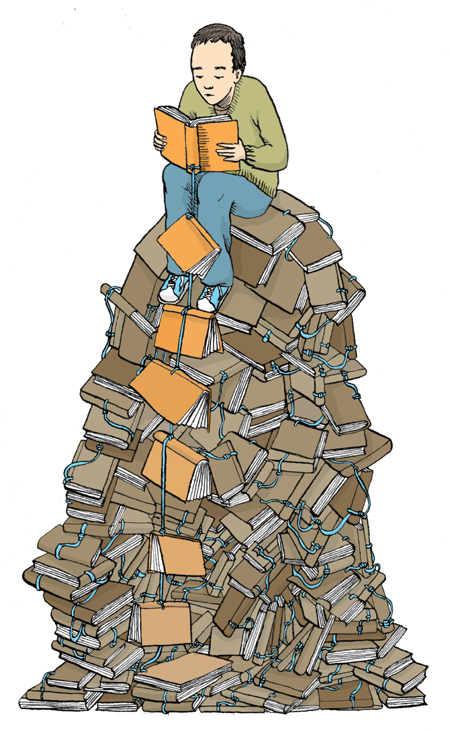 Can you read 400 books each year and get as much out of them as you would if you only read 40? I don’t know the answer and I certainly don’t want to judge those readers. I can’t imagine ever reading that much, but everyone is different and my reading style is not anyone else’s reading style. Or maybe I just watch too much television. I’d love to hear other thoughts. I'm always baffled about how people find the time to read that many books too, I usually average about 30 to 40 books a year. I agree with Emily that maybe they read lighter books, I've just finished three Sookie Stackhouse novels and I think I read them all in a little over a week. Otherwise I really don't understand how they can read that much in a year! I'm having a really good year and am on pace to read 200 or more books before Jan. 1. I think it's going to be the most I've read since I started keeping track. Generally, it's somewhere around 150-175 a year. I would bow down to anyone who can read 300+ books a year. I don't know how you'd do that unless it's your job. Last year, I read 50 books, and I think that was the most I'd ever read in a year. It was a struggle to get that many in. This year, I'm on track to finish 50 with little effort. It just depends on my life. I made a huge move for work and lived with relatives for a while last year so it was harder to fit in pleasure reading. 100 would be a lot for me, but it doesn't sound too outrageous. I like your idea of not setting a goal (although I feel like I would always have one in the back of my mind). Especially if you want to read some hefty classics. War and Peace definitely brought down my reading total for the year but was an accomplishment in itself. [BTW, I highly recommend Anna Karenina].Susan reads a lot of the same young adult that you and I do. She also reads a lot of fantasy novels but those are usually pretty lengthy. I'm amazed with her. I recommend a book and she's finished it before I'm done telling her why she'll like it.I know I get very distracted. Especially with the iPhone – it's always around and always enticing me to check my email, twitter, facebook. I should take my book somewhere. I kind of miss reading in coffee shops like I used to in Ann Arbor. I used to go upstairs to my loft to read War and Peace and leave my phone downstairs. That was pretty successful.My DVR keeps getting close to full so I may have to cut some shows as well. But which ones go? Either way, my books bought for any given month totally exceed the books read. I think subconsciously I'm waiting to get mono or something similar, something where I'm housebound for weeks. I hadn't even heard of Unwind but it looks interesting and has excellent reviews on amazon. I'll have to check it out. I would probably read more YA if my husband didn't constantly tease me when I do. :PI think that buying more books than you read is simply the sign of a book lover. I've probably only read 1/4 of my books and I'll never catch up (unless of course I figure out how to read 400 books per year). I think I'm hoping for one of those long homebound periods, too (maybe maternity leave someday with the perfect baby who never cries is my best hope). Yeah, it's also easier to read a lot when you're single, like I am. 🙂 I live by myself and my dog doesn't care how much I read, provided he can sit in my lap while I'm doing it. Oh, you definitely have to read Unwind. It is one of my favorite books ever. Regarding goals: I read 50 books last year because I set a goal. This year, I made a list of 10 books that I really wanted to read instead. It feels like homework, and I am not going to meet the goal, but I think reading that 50 last year got me into the habit of reading a lot (I know I should already do that as a librarian). Now that I got into the habit of reading a lot, I'm done with goals. I'm now reading what and when I want (except for book club books). When I was younger I read a lot more books a year than I do now. I've never kept track of exactly how many. I'm a lot busier now than I was in high school, so now I do a lot more re-reading of old favorites, with the occasional new book thrown in. The last one I finished was Street Gang, which actually has nothing to do with gangs and everything to do with "Sesame Street". This is really a wonderful post! It was a pleasure to read the discussion on it too! I normally read around 40-50 books in a year. Last year I read 50. This year I planned to read 24 books (2 books a month) with a few of heavyweight classics thrown in – 'War and Peace', 'In Search of Lost Time', 'The Canterbury Tales', 'The Pickwick Papers'. I have completed reading 20 books till now and I think I will meet my goal, in terms of numbers. But I haven't read any of the big books that I had planned to read, and so I would say it has been a not-so-good reading year for me. But I am hoping that I will be able to complete atleast one 'big' 1000+ page book this year – I am hoping it will be 'Kristin Lavransdatter' by Sigrid Undset (have read one-third of it till now). School books definitely count. At least I always counted them. Those are some interesting calculations. If only we could do away with sleep or work. I already passed my number from last year (I think it was in the low-mid 20s). I bet goals do make you stay away from those big books. I think I tend to read easy YA novels when I feel like I haven't accomplished much in awhile. Last year I read 66 books and I thought I´d try for more this year, but then I found myself hurrying to finish because for the end of a month so I´m not going to count until this year is over. I have no idea how people read so many books, I´d guess it´s the quality or they read all the time, it´s amazing to be able to read so much. But it´s not for me. Sometimes I don´t read another book for a week because I want to enjoy the feel of the book I just finished. My reading has increased since 2009 when I got really into YA, dystopians especially. Although YA are shorter 300-500 pages I still don’t get up to the 200-300 book mark. This year I did 100 books on Goodreads but it was at a financial stretch and never again. It’s probably easier to do when you can pick any cheap paperback of the shelf but being blind and having to rely on audio, braille and ebooks… It takes a lot of time waiting for the accessible formats to be made and then affordable. I read 7 books in one day but that’s only because I can speed listen and they were under 4 hours running time each.